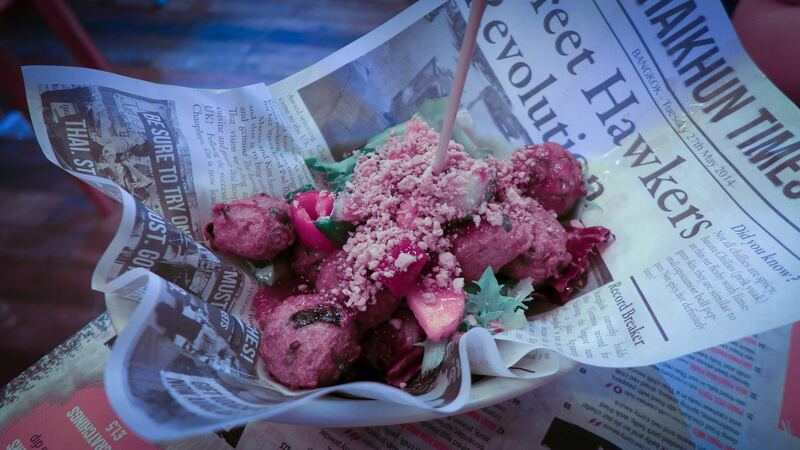 When was the last time you ate “street food” on an actual street? It’s one thing to get a bunch of food vans and stalls together at events such as Newcastle’s upcoming Craft Beer Calling festival (which I’m very much looking forward to this October), or those much-missed Boiler Shop Steamers, but it’s stretching things to the point of snapping to serve up small dishes in an actual bricks and mortar restaurant and call it street food. Yet that’s how Thaikhun describes itself. 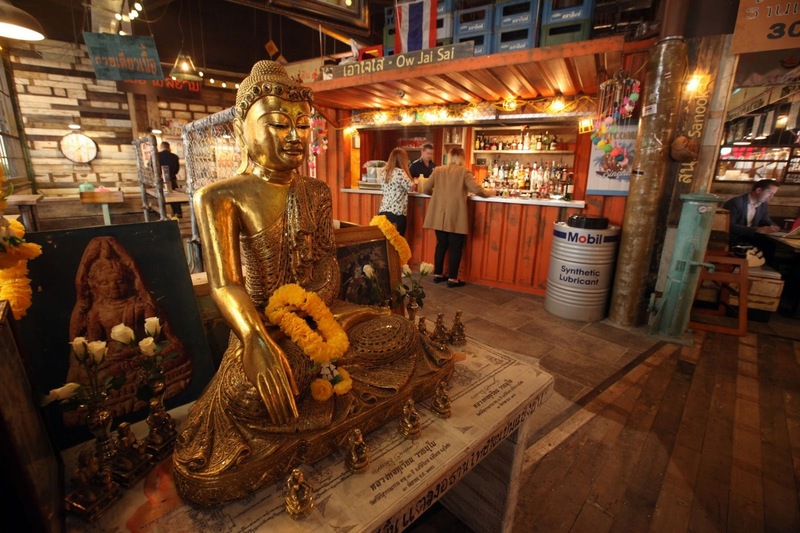 ‘Our vision and passion is to bring authentic Thai street food from the streets of Bangkok to the streets of the UK,’ enthuses its website. Sadly, the Metrocentre on a Monday evening feels about as far from street as it’s possible to be. 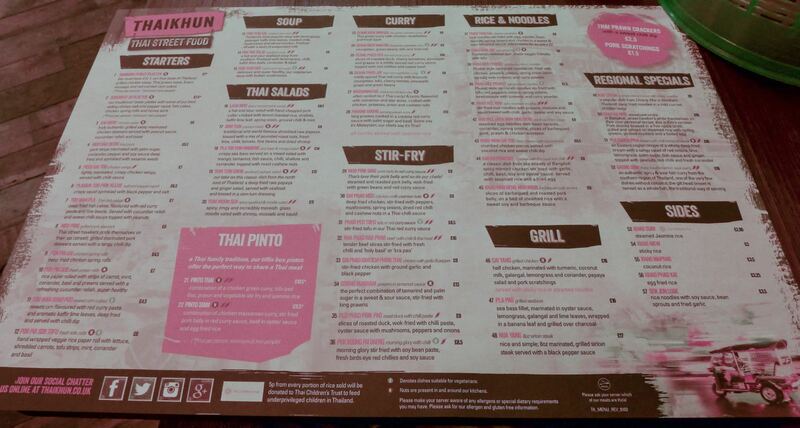 It’s one of a number of new-to-round-here chain restaurants to take seed within the £17m redevelopment of the Qube. You can see what they’re getting at, of course. 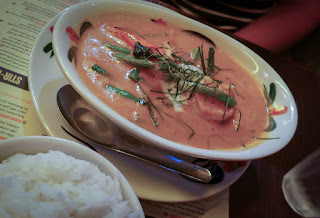 Many readers will have visited Thailand at some point, and been blown away - perhaps literally, depending on the number of scud chillis in the broth - by the amount of flavour that can be purchased for just a few baht from a hawker stall down some Bangkok back street, or from a water-borne noodle vendor on a khlong tour. Those who haven’t experienced this culinary joy would probably like to. But lo! 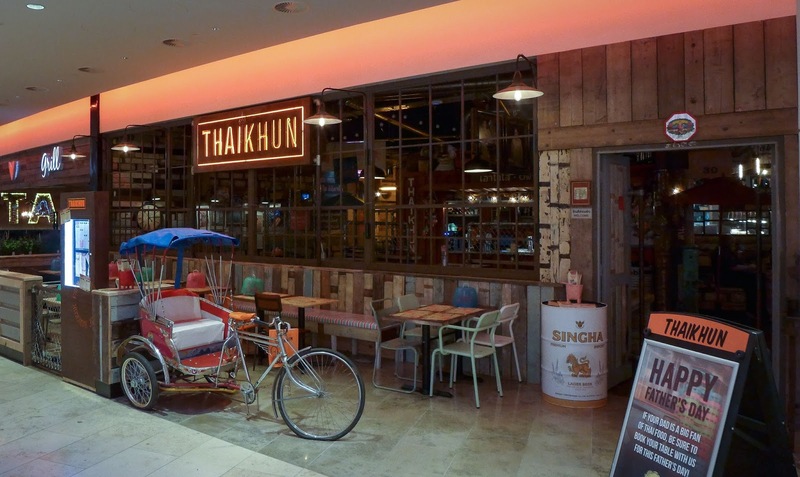 It turns out you don’t even have to leave the comfort of your own shopping mall to get a slice of Thai streetlife. Or does it? Wai-ed and seated, with a glass of the perfectly acceptable if rather characterless Thai Monsoon Valley white in hand, things got off to a rather auspicious start. Fishcakes were nifty little fellows, and properly made. Fried to the shade of a gap year student’s tan, they had just enough egg about them to provide all-too-rare lightness and bounce. Well played. Chicken satay is probably more Malay or Indonesian than Thai, but who cares: this version was really pretty good. 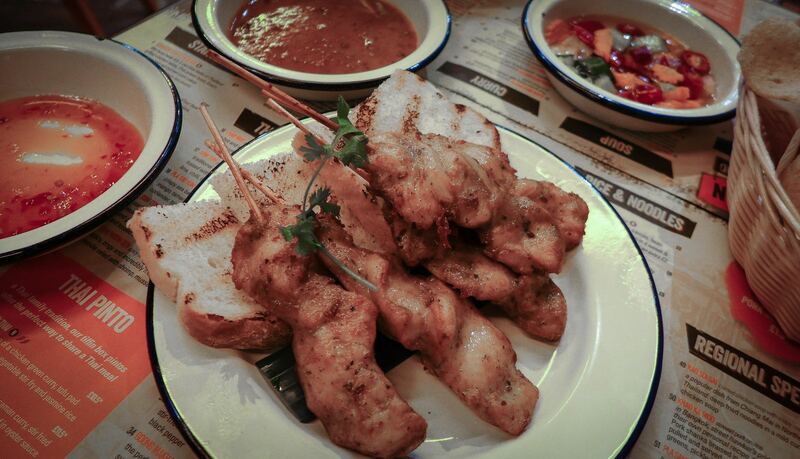 The skewers had picked up a bunch of seasoning from their sweet soy marinade, and a whisper of char from the grill. The peanut dipping sauce was smuttily moreish, although I was as perplexed by the accompanying slice of white toast here as I remember being when served it in a Bangkok café many moons ago. Sometimes “authenticity” can go too far. 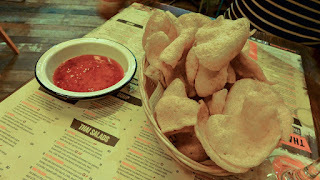 Some prawn crackers had a pleasing waft of spice about them, though their sweet chilli sauce was Gloop Central. Spirits duly raised, as ever they are by a few well-prepared snacks and a glass of wine, we took a moment to take in our surroundings. Actually, we took several moments, as there was so much going on. 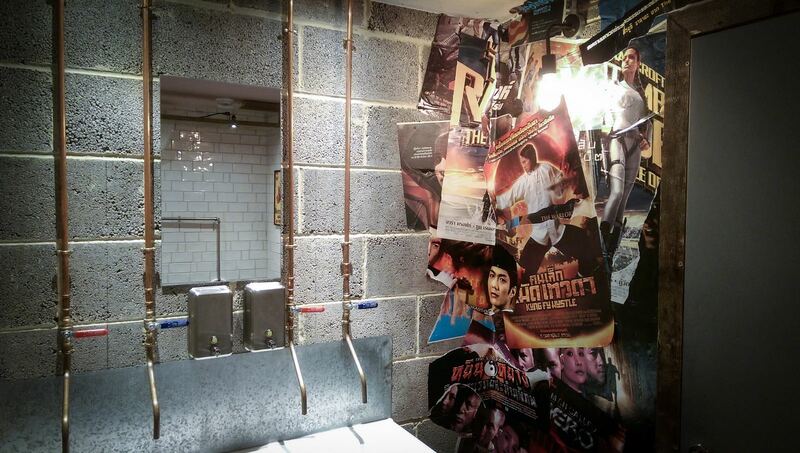 In whatever design meeting they had to choose the décor, I don’t think there was a single idea they didn’t love. How best to describe it? There’s just...stuff everywhere. Old TVs, Singha beer barrels, Buddhas, knackered motorbikes, street signs, adverts for Castrol GTX oil, all punctuated by filament lightbulbs. I think it’s meant to convey something of the frenetic eclecticism of Southeast Asia, but it comes over more like one of those TV programmes about extreme hoarders. 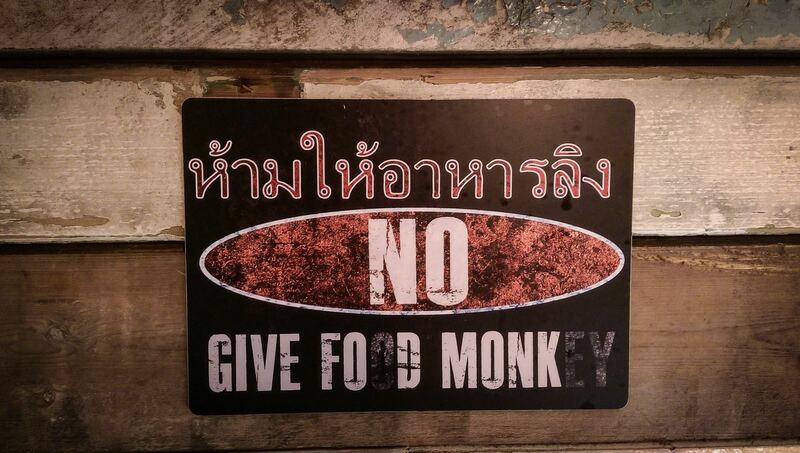 I visited the toilet, only to be confronted by a sign asking me not to feed the monkey. I’m not sure what that meant. 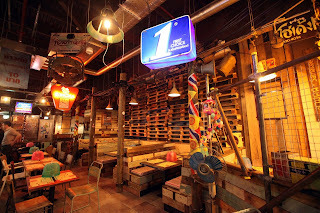 I returned to the food, which, unlike the decor, was about to take a turn down drab alley. 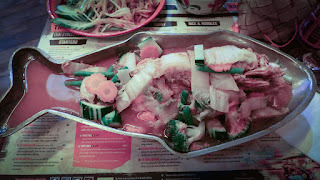 Mrs Diner’s prawn Panang curry wasn’t actively bad, but it lacked the body that usually characterises this dish, and could have done with a freer hand with the fish sauce. I had high hopes for my whole fried bream in sour curry, but there was nowhere near enough complexity to keep this enormous portion interesting to its death. The fish itself, lacking flavour, was battered into submission. Meanwhile a papaya salad was a grim facsimile of one of the world’s truly great salads. 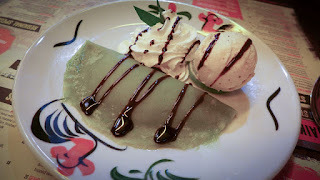 In the interests of journalism rather than any remaining hunger we tried a pandan pancake, which was green, and that’s all you can really say about it. Service throughout was full of charm and warmth. Here’s the thing: Thai street food, in Thailand, is great. It is embarrassingly cheap, loaded with flavour, and made by people who are expert at making the same limited range of dishes over and over again. Oh, and it’s actually served on the street. Or maybe at a plastic table. On a street. The food at Thaikhun started well before fading badly, but I sense it was cooked by people who aren’t that expert at making the vast range of dishes on the menu. Also, it is nowhere near a street. 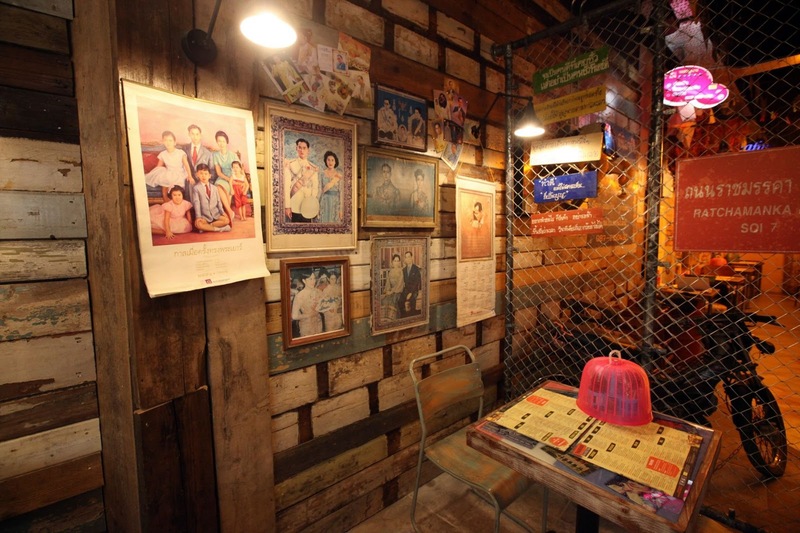 In short, Thaikhun is almost everything that Thai street food is not. And then there’s the price. Although we ate more than your average table of two, we managed, with only one glass of wine, to run up a bill close to seventy quid, not including service. 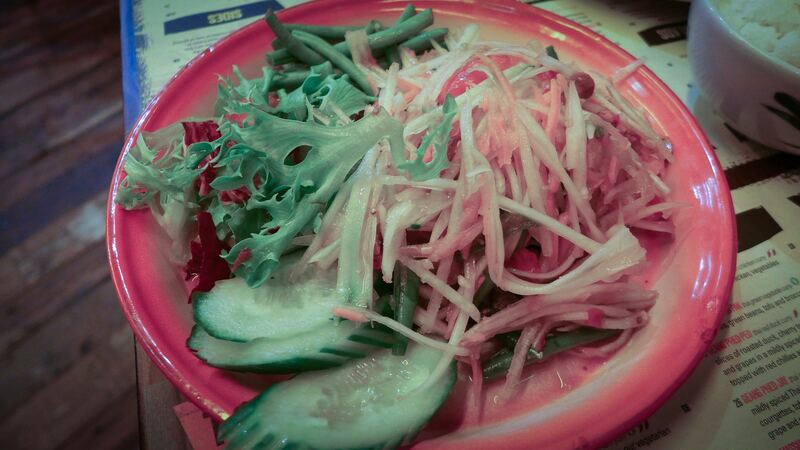 That papaya salad cost me nine quid for some chopped, dressed vegetables. 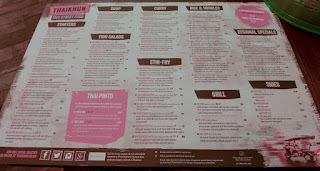 The Metro Centre used to be a total desert as far as halfway decent food is concerned, so I guess that, on balance, this place is a welcome addition. If you’re off to the pictures then you could do worse than a glass of wine and a couple of starters. If you’re after anything more substantial, Byron is (unless you’re boycotting it) just round the corner. But I’m afraid that until intu find a way to get more interesting food outlets into their spaces, that’s about as good as it gets.